December 3rd, 2014, Charlottetown – A dozen Island short-track speed skaters brought home medals from the recent Harold Joyce short track championship meet in Fredericton, N.B.. Jared Vriends of Pleasant Grove in Division 3, Kristen Binns in Division 6, Simon Hale in Division 9 and Rob Binns in the Masters Division earned gold medals for the P.E.I. squad. Taking silver medals for P.E.I. were Zach Moran of Charlottetown in Division 3, Miriam Burnett in Division 3, Andrew Binns in Division 5 and Carter Bruce of Stratford in Division 8. Burnett finished as the top female skater from P.E.I. in the event. Peter McQuaid and Korrina LeClair in Divison 3, Thomas McQuaid in Division 6 and Liam Chatfield in Division 11 completed the Island medal haul, bringing home bronze. Carter Bruce of Stratford (foreground, center) won a silver medal for P.E.I. at the recent Harold Joyce Short Track Championship meet in Fredericton, N.B. Bruce’s podium finish was one of twelve medals earned by the Island club.Photo courtesy of Duncan McSporran. The medalists were among nineteen P.E.I. skaters in the field of over 135 short-track skaters from across the Maritimes. The Fredericton meet had an added bonus for the P.E.I. contingent, as double Olympic medalist Anouk English skated in the same division as six Islanders. English won silver and bronze medals in Torino in 2006 before retiring from the national team and moving to New Brunswick to start a family. 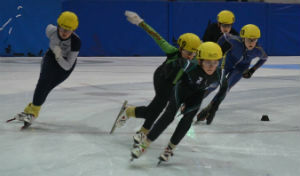 Island skaters went head to head with English in their 1000 and 1500 metre distances and in the 3000 metre points race. Also representing P.E.I. at the Fredericton meet were Andrew McQuaid, Matt Kozma, William Lyons, Karla Mccallum, Addison Bruce, Jane Bruce and Zachary Chatfield. The meet also served as New Brunswick’s Canada Winter Games team selection event for short track, with Brendan Corey of Fredericton grabbing the top spot for males and Alyssa Seymour, also skating for Fredericton, winning the female title. P.E.I.’s short-track team for the Canada Games will be named in late December. P.E.I.’s speed skaters will be back on the ice for a mini meet at home this Saturday morning at the Eastlink Centre. They’ll then close out their 2014 competition calendar with the Charles Gorman Memorial meet at Saint John’s Harbour Station on December 13th and 14th.